A week or so ago, I happened upon the episode description for “The Wrath Of Savitar” on my cable guide, and my heart sank as I read these fateful words: “which he hides from the team.” The rest of the sentence doesn’t really matter, because those six words encapsulate a weird sort of mental block on the part of the show’s writing staff. Either they can’t remember how many times they’ve built conflict out of those six words, or they just don’t care how often they repeat themselves. In turn, this puts me in the position of having to repeat myself yet again: enough with the members of Team Flash withholding crucial information from each other to create artificial drama. It’s so tired, it’s so boring, it’s so old. In this particular case, the episode description is a little off, since Wally ends up sharing the fact that he’s been seeing Savitar about seven minutes into the hour. Still, within the reality of the show, this has been going on for about a week, which is long enough to warrant a lecture from Barry about the dangers of keeping this to himself. Worried that Savitar may be spying on the team through Wally, Barry dismisses him from STAR Labs with a gratuitously dickish “Wally, you’re out.” Because Barry remains the worst, we soon learn he’s been withholding some information of his own. What begins as a celebration of his engagement to Iris turns awkward once Wally convinces Cisco to vibe him into the future for a peek at Iris’ murder (an event we apparently just can’t see often enough). He notices she’s not wearing her engagement ring and realizes Barry’s proposal was another means of trying to change the future. Rest assured that Barry and Wally aren’t alone in keeping secrets from the team. Caitlin has been hanging onto a shard of the Philosopher’s Stone, thinking it might be the key to ridding herself of Killer Frost’s powers. This turns out to be a lucky break once they learn Savitar has been imprisoned in the Speed Force, where Barry threw the Philosopher’s Stone. Alas, Wally doesn’t get the memo in time. He takes Caitlin’s sliver from STAR Labs and throws it into the Speed Force, freeing Savitar and leaving Wally trapped in his place. That last bit of business is about all the action this episode has to offer, as most of it is devoted to reestablishing Savitar as the season’s main threat (although I’m halfway inclined to agree with him that Barry is actually the Big Bad). 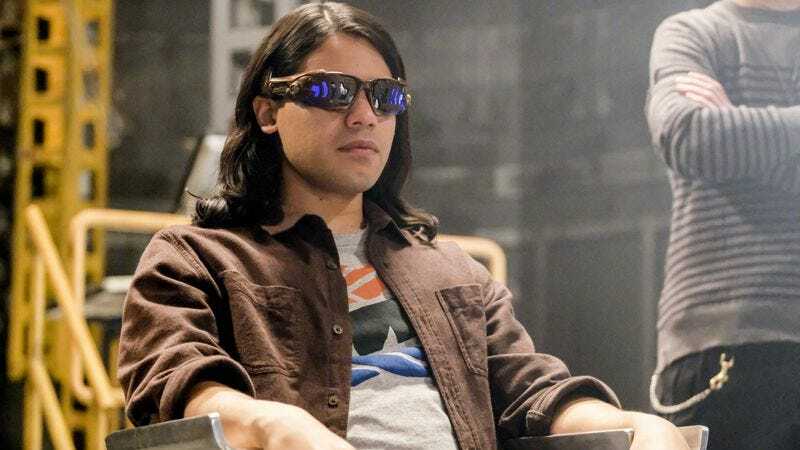 When Cisco arranges for Savitar to speak through Julian, we get a vague backstory indicating that his beef with Team Flash is very personal. The “Who is Savitar?” guessing game this is designed to provoke again feels repetitive: didn’t we just go through this with Zoom last season? The obvious choice is Julian, but it’s so obvious even he can see it, so he’s automatically the least likely suspect. Wally is another possibility, but that would necessitate a seemingly unsolvable time paradox: Savitar couldn’t have given himself his powers unless he already had those powers, but he couldn’t have had them before he gave them to himself. So who does that leave? Thawne again? It’s still hard to care that much about another Big Bad speedster, but at least Savitar’s escape gives the season some focus and momentum going forward. Anything to distract from the Team Flash dysfunction is welcome at this point. It’s frustrating: Berlanti and company have been given such a huge sandbox to play in: the multiverse, time travel, the Speed Force, a fabulous Rogues Gallery, and on and on. They didn’t create any of that stuff, but most of the best episodes have used these raw materials of the DC universe to great advantage. With all of these fantastic elements at their disposal, why do they insist on repeating themselves so much lately? The Flash desperately needs to shake up the formula. Maybe with, and I’m just spitballing here…a musical episode? Given the grim state of affairs by the end of this episode, it’s kind of hard to believe the musical crossover with Supergirl is happening in two weeks. It’s not a minute too soon, though.